Bog Hog, has a wild side, combining the brute power and durability of a monster truck with the madness of a mud racer. Bog Hog is a beast, and JConcepts has worked together with designers and builders to replicate this body shell to fit on a host of popular chassis including the Axial SMT10. Slouched at the starting line, engine headers glowing and flowing, the flag goes down and Bog Hog roars. The atmosphere surrounding Mega Trucks excite even the most mild mannered racers. From the shop in Poplar Branch, North Carolina, Dennis Anderson has created another classic Mega Truck. Following in the footsteps of King Sling, Bog Hog is another animal forged in iron. Weston “Teenyman” Anderson, the teenager behind the wheel of the “Anderson Boyz” latest creations has a knack for spectacular driving. Whether the techniques are learned from the master himself or naturally run through his veins, Weston has catapulted Bog Hog into the spot-light. As if the bright orange body, rice and cane tires, tube chassis and nitrogen charged shock suspension wasn’t enough, the striking graphics of the gnarly swamp beast in flames is sure to gather your attention. Working with Dennis Anderson, Fred Reep and the JConcepts crew went back to the drawing board to once again carve out a legend. The slate was once again wiped clean and the form started to take shape in the computer to fit and finish on a selection of vehicles. A lot of hand dressing took place to ensure the details were correct on the shell itself. Fred “Freestyle” Reep sat shotgun on this project reviewing the style, shape and decal creation to ultimately please the man, the myth, the legend, Dennis Anderson. No superstar race machine would be complete without decoration. The Bog Hog is unique and includes two decal sheets in the package that covers logos, signatures, flames and branding recognition. The product is formed in durable polycarbonate and includes painting window mask for ease of use. Fine detailing and trimming to the body shell comes from the purchasing enthusiast where the imagination and skill set takes over. 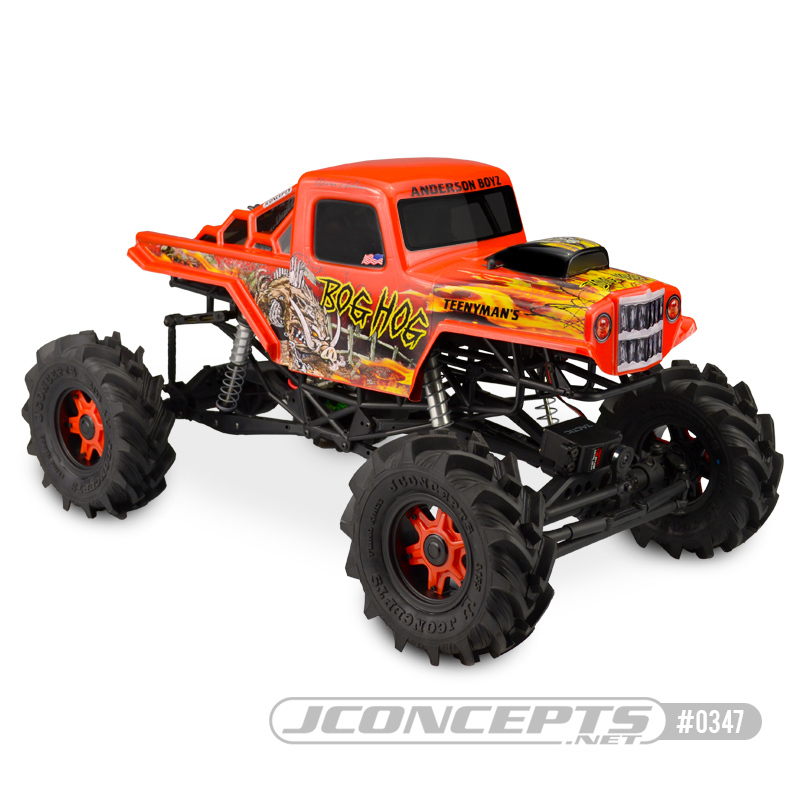 The JConcepts team met on location to photograph, measure and sketch up the 1:1 Bog Hog. Experienced industry insiders sat to discuss the project and lay plans to fit and finish the popular body to several popular chassis sets on the market. Computer drawings were completed during the Winter of 2018 and from there, professionals at JConcepts took the necessary hand finishing time to pin-point focus sections of the creation. Hood-scoop and final fitment were complete during the Spring and decal designs finished and put into production during early Summer. Test samples were produced and the first working prototype hit the dirt during the early Summer of 2018. A Bog Hog video is in the pipeline, stay tuned to JConcepts Inc on Facebook, YouTube and Instagram for the final cut.